4 The Journal of Commerce | August 6 2018 www.joc.com Mark Szakonyi CSX TRANSPORTATION IN the April- June period hit its best quarterly oper- ating ratio of 58.6 percent, a railroad's best measure of profitability. The coming months, however, will reveal whether CSX can achieve the same e ciency envisioned by its late CEO, E. Hunter Harrison, for its intermodal franchise — and shippers are along for the ride as North America's intermodal peak season nears. The railroad's intermodal chal- lenges came into focus during the car- rier's July 17 second-quarter earnings call. CEO James Foote's admission that the intermodal franchise "to a large degree, is dysfunctional" came after intermodal shippers experienced ser- vice disruption in the early months of Harrison's network shake-up and now have fewer domestic service options after the culling of more than 300 ori- gin and destination pairs since March 2017. More changes are on the way. "We are going to have very good and open communication with our customers about what it is we're trying to accomplish, and it involves train design changes, it involves terminals, and potential terminal consolidations," Foote said. "And we will do this very methodically and logically and appropriately, and do it being fully aware of the fact that we are looking at a peak season this year which everybody is indicating us is going to be very strong." The changes will allow CSX, whose network spans the eastern half of the US, to provide a stronger intermodal service that can collect a premium, Foote said. With shippers paying 15 to 20 percent more for truck than rail, "why discount your better quality product when you know you can go save the customer money by having a service that's more truck like." Inter - national intermodal growth drove the 7 percent year-over-year rise in volume in the second quarter, with domestic intermodal, the product competing with truck services, virtually flat. What's next? Expect a softer approach to shipper concerns as CSX works to mend relationships, which were hurt when Harrison rolled his aggressive cut-to-the-bone strategy that succeeded in raising profits when he led Canadian National Railway from 2003 to 2009 and Canadian Pacific from 2012 until January 2017. CSX's breakdown in intermodal service — which appears to have recovered, with train speeds in the 28- to 29-mph range compared with lows of 27 mph during the spring of 2017 — also drew the scrutiny of the Surface Transportation Board, the US rail regulatory agency. Foote may be a disciple of Harri - son's precision railroading gospel — the disciplined scheduling of services forcing shippers to deliver cargo at set times or miss train starts — but he's signaling a less "bull in the china shop" approach. 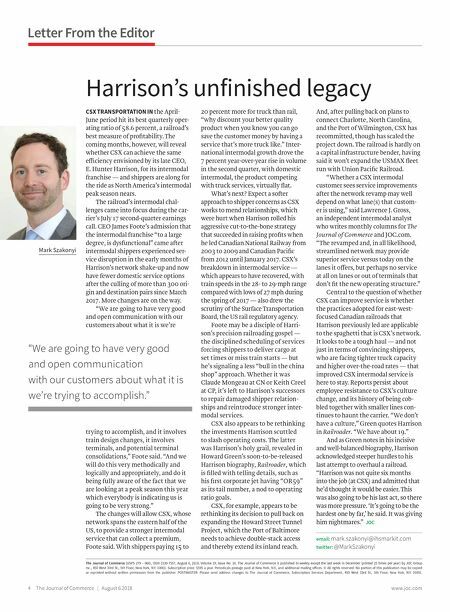 Whether it was Claude Mongeau at CN or Keith Creel at CP, it's left to Harrison's successors to repair damaged shipper relation- ships and reintroduce stronger inter- modal services. CSX also appears to be rethinking the investments Harrison scuttled to slash operating costs. The latter was Harrison's holy grail, revealed in Howard Green's soon-to-be-released Harrison biography, Railroader, which is filled with telling details, such as his first corporate jet having "OR59" as its tail number, a nod to operating ratio goals. CSX, for example, appears to be rethinking its decision to pull back on expanding the Howard Street Tunnel Project, which the Port of Baltimore needs to achieve double-stack access and thereby extend its inland reach. And, after pulling back on plans to connect Charlotte, North Carolina, and the Port of Wilmington, CSX has recommitted, though has scaled the project down. The railroad is hardly on a capital infrastructure bender, having said it won't expand the USMAX fleet run with Union Pacific Railroad. "Whether a CSX intermodal customer sees service improvements after the network revamp may well depend on what lane(s) that custom - er is using," said Lawrence J. Gross, an independent intermodal analyst who writes monthly columns for The Journal of Commerce and JOC.com. "The revamped and, in all likelihood, streamlined network may provide superior service versus today on the lanes it o¤ers, but perhaps no service at all on lanes or out of terminals that don't fit the new operating structure." Central to the question of whether CSX can improve service is whether the practices adopted for east-west- focused Canadian railroads that Harrison previously led are applicable to the spaghetti that is CSX's network. It looks to be a tough haul — and not just in terms of convincing shippers, who are facing tighter truck capacity and higher over-the-road rates — that improved CSX intermodal service is here to stay. Reports persist about employee resistance to CSX's culture change, and its history of being cob - bled together with smaller lines con- tinues to haunt the carrier. "We don't have a culture," Green quotes Harrison in Railroader. "We have about 19." And as Green notes in his incisive and well-balanced biography, Harrison acknowledged steeper hurdles to his last attempt to overhaul a railroad. "Harrison was not quite six months into the job (at CSX) and admitted that he'd thought it would be easier. This was also going to be his last act, so there was more pressure. 'It's going to be the hardest one by far,' he said. It was giving him nightmares." 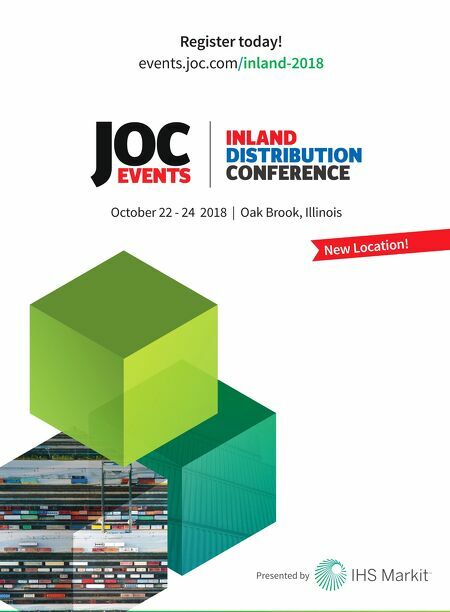 JOC email: mark.szakonyi@ihsmarkit.com twitter: @MarkSzakonyi Harrison's unfinished legacy The Journal of Commerce (USPS 279 – 060), ISSN 1530-7557, August 6, 2018, Volume 19, Issue No. 16. The Journal of Commerce is published bi-weekly except the last week in December (printed 25 times per year) by JOC Group Inc., 450 West 33rd St., 5th Floor, New York, N.Y. 10001. Subscription price: $595 a year. Periodicals postage paid at New York, N.Y., and additional mailing o˜ices. © All rights reserved. No portion of this publication may be copied or reprinted without written permission from the publisher. POSTMASTER: Please send address changes to The Journal of Commerce, Subscription Services Department, 450 West 33rd St., 5th Floor, New York, N.Y. 10001. Letter From the Editor "We are going to have very good and open communication with our customers about what it is we're trying to accomplish."